Blackstar Canyon is a secluded canyon located ten miles east from the heart of Orange. Blackstar has a reputation in Orange County for being haunted. 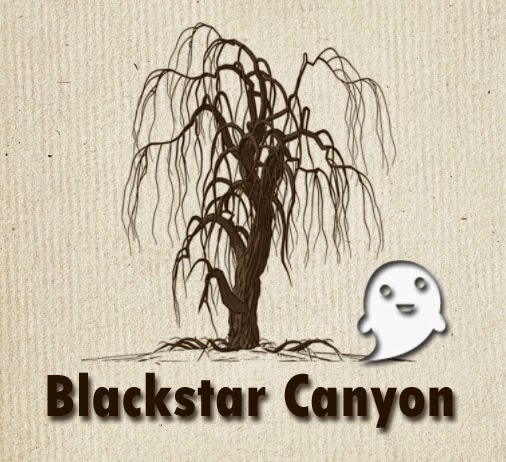 Every year around Halloween, Blackstar becomes a popular hiking destination for ghost hunters and local ghost tours. Having recently hiked the canyon myself at night, I can honestly say that it’s definitely a spooky place. I don’t actually believe in ghosts, but mountain lions and bobcats are known to inhabit the canyon. If the thought of a mountain lion pouncing on you from behind doesn’t spook you, I don’t know what will. Blackstar Canyon has a hidden waterfall and a cave at the mouth of the creek. From pictures, the falls look amazing when they are running, but they were bone-dry both times I visited. The hike to the waterfall is a little over 6 miles round-trip. The first two miles of the hike follow a wide dirt road that winds its way into canyon, crossing several bridges and never veering too far from the creek. The canyon is filled with willow, acorn, eucalyptus, oak, and a variety of other large trees. The trail cuts through several areas which are privately owned and fenced off with electric and barbed wire. You can spot the remnants of a dilapidated squatter’s camp just off the trail. three- way junction. The main road veers away from the creek to the left and heads further into the mountains. The middle trail, a smaller single track hiking trail, follows the rim of the creek and gradually leads up into the mountains. The right-hand trail descends to the creek bed and leads upstream to the waterfall and the cave. Many people miss the right hand spur for the waterfall. There is no marker and no sign and it frequently gets washed out by the rain. When its muddy and wet, you might want to just hack your way through the brush down to the creek bed. The trail literally leads upstream in the creek bed, so you know you can’t get lost. The first half mile in the creek bed is easy going. You have to make several small stream crossings. Its gets washed out with every rain storm, so you will likely get your feet wet. The last half mile of the Blackstar Waterfall hike is tough. There are several spots that require major rock scrambling and log crossing. A member of our hiking group fell off a slick log and ended up soaked to her knees in the creek. 1 or 2 of the climbs in the final half mile are probably beyond the abilities of the elderly or the obese. Those who master the last half mile are rewarded with a view of the cave and the waterfall (if its running). Make sure to bring plenty of water on this hike and don’t hike it at night. The rock scramble could be a fatal mistake at night, and it might be your ghost that haunts the canyon next Halloween. This is a great hike to bring your mountain bike. The trail from the parking lot to the creek is fairly level and you can cut at least 90 minutes off your hiking time if you bring your bike. Don't forget to bring your lock so you can secure your bike to a tree at the creek. You won't be able to haul it up the last mile to the waterfall. From the city of Orange, head East on Chapman Ave. Chapman Avenue becomes Santiago Canyon Road. Continue on Santiago Canyon Road past Irvine Lake. Next, turn Left onto Silverado Canyon Road, then make an almost immediate left onto Blackstar Canyon Road. Follow Blackstar Canyon Road for one mile to the locked gate. There is plenty of room for parking in the dirt pullout areas at the gate. Don’t leave your car parked after sunset or you risk getting a ticket.